On the eve of Paris-Roubaix, the most celebrated of the classic cobble-stoned bike races, we share this Op/Ed. When men were men, there were no compliant carbon bikes. Bikes were harder than the cobbles. They rattled teeth, bounced eyeballs out of sockets, testicles were lost and now look at what the industry is marketing: Soft Spartacus for the Fondos. There are cobbles in downtown Seattle on several streets, exposed under pavement, worn out from years of abuse from cars and the weather. One famed stretch of them is right around the corner from where the D-Plus was made. We hit those like we’re juiced up on EPO, fly over them for 30 seconds, and imagine we’re finishing 1,2,3 in doo rags. Back then, dope soaked up the pain and the consumer market was younger. We weren’t waiting for the latest flexy carbon bikes to arrive at shops or AARP magazines in mail boxes. This one time, a bro broke his chain ring on Seattle cobbles. He’s still legend for that. Cause cobbles hurt and should. 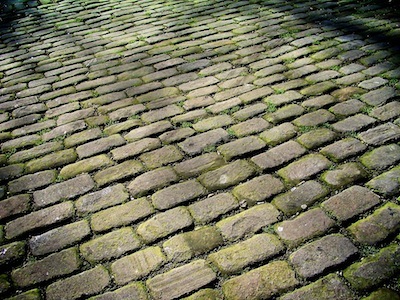 See more cobbles on Flickr and are there some near you? Cobble photo by Kristin Marie Enns-Kavanagh, as seen on Flickr.